Your tour begins on after arrival at Chandigarh Airport/Railway Junction. Private airport/hotel transfer upon arrival/departure. Hotel accommodations in Shimla and Manali. Hotel breakfast daily; three-course dinners (veg or non-veg), including a welcome drink at hotel check-in. Full support for all travel journey. Airfare from your point of origin to and from the trip is not included in the package. insurance, airport taxes and fees, and foreign port taxes, unless otherwise specified. High/On season surcharge if applicable. Anything not specifically mentioned in ‘includes’ box. Gratuities to tour guides, driver, and trip manager. Please print your booking e-Ticket and present it with your valid photo ID on the day of activity to the tour guide. And remember e-Ticket is your proof of hotel/volvo/car confirm booking. All the tour guides are bilingual, Hindi/English. If it happens that there are only Hindi speaking visitors on the tour, the tour will only with Hindi tour guide. Children elder than 5 years of age travel will be charged, provided they do not occupy a seat on the bus, or a bed in the hotel room. Booking of any travel services represents your acceptance T & C set out herein. Please ensure that you read carefully and understand company T & C prior to confirm booking. Your inquiry does not guarantee booking confirmation. Your booking will be initiate a reservation process. We will confirm with you via email/phone-call within 24 hours (working day). Once confirm booking by a partial or full payment, cancellations will only be accepted in writing. Package rates may vary due to hotel/volvo/car/air-ticket/train-ticket availability. We reserve all right to make price adjustment without any prior notice. Please refer to our Cancellation and Money Refund Policy before you make any confirm booking. Local tour agents reserves all right to make modifications in tour itinerary/arrangements, hotel and its location if deemed necessary. The tour agent holds itself free of any responsibility for any cause, in all matters connected with hotels, accommodations, sightseeing tours and transportation, whether by air, rail, bus, car or any other means. Any baggage and personal effects are at the owner’s risk throughout the tour or in hotel unless insured. As we will make all effort to retain a regular operation, we reserve all right to cancel any scheduled trip and issue a full refund to affected customers under special circumstances. via NH3 (This route has tolls) : The driving distance between Chandigarh To Manali, Himachal Pradesh by this route is approx 307.4 km, and Travel Time by this road route is 6 h 33 min with traffic and 6 h 15 min without traffic. via NH 21A and NH3 (This route has tolls) : The driving distance between Chandigarh To Manali by this route is approx 293 km, and Travel Time by this road route is 6 h 53 min with traffic and 6 h 30 min without traffic. 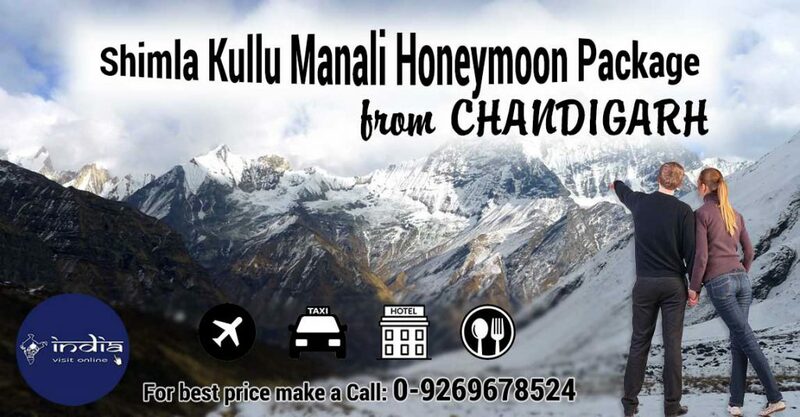 f you are seeking Shimla Kullu Manali Package from Chandigarh with plenty of adventure activities, then you check out below listed are customized budget to luxury honeymoon packages. People from worldwide come to experience spellbinding adventure activities here. Manali offers a wonderful setting for enjoying honeymoon, and an ideal summer getaway for those who want to relax in the snowy mountains and spend time in isolation. A honeymoon is a superb experience at once in everyone’s life, remembering that you will take till your last breath. Make your once-in-a-lifetime honeymoon experience memorable with our couple friendly honeymoon packages. Kullu and Manali are engaged picturesque places compound with an exotic view, not only for honeymooners but also tourists from around the world. Manali, located in the heart of the Kullu Valley of Himachal Pradesh is dotted with some of the finest ski resorts in the country, where one can thoroughly enjoy this bracing activity. Kullu-Manali is definitely an enviable climate that seeks panoramic views, magnificent fountains, or traditional quiet towns. Apart from the exotic wildlife century The Great Himalayan National Park, Kullu Valley is also renowned for its incredible wealth of plant and abundance of wildflowers. Thus, it’s important to choose only the Best Manali Honeymoon Package, which are offered by renowned honeymoon travel agents IndiaVisitOnline. Our packages come with Volvo reserved tickets, accommodations at the best area hotels assure confirmed, pick and drop premises, tour guides for explaining more about the place and the auxiliary services as appropriate. We also organize Chandigarh to Shimla honeymoon trip in such a manner that every location can be visited over its better time. This will assist the young newlyweds couples to appreciate the beauty of the sites and having an amazing time. Today, Himachal ranks as one of the top honeymoon destinations of the world, due to its large variety of choices attractive rates and high levels of satisfaction offered. The most beautiful hill station in India, Shimla-Manali and Kullu are considered as some of the ultimate honeymoon destinations in the northwestern region of the great Himalayas. Kullu and Manali offer the right kind of quiet, serene, and perfect honeymoon atmosphere for newlyweds to understand each other. Here, we provide all information about online hotel reservation for a visit to Shimla, Kullu and Manali, which are regarded as honeymooners paradise.